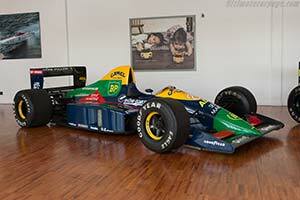 As an engine supplier to the small Larrousse team, Lamborghini entered Formula 1 at the start of the 1989 season. During the previous two years the French team, founded by former racer Gerard Larrousse and Didier Calmels, fielded Cosworth V8 engined Lolas. For 1989, Lola was retained as the chassis supplier but in addition to a new engine supplier, there was also a change at the top as Calmels was imprisoned for the murder of his wife. What Lamborghini brought to the plate was a brand new V12 engine, which had been designed by former Ferrari chief engineer Mauro Forghieri. Dubbed the 3512, it had a 80º V-angle and displaced just under the 3.5-litre limit. It was reported to produce around 600 bhp, which was around 10% down on the most powerful engines on the grid. Lamborghini realised the engine was still early in its development curve, which is why the Italian company picked a mid-field team to make their Grand Prix debut. For the opening round of the 1989 World Championship, the team used a modified version of the 1988 car. The new LC89 was ready in time for the San Marino Grand Prix. As before, the car was developed by Lola, where it was designed by Chris Murphy. It was a straightforward machine built around a carbon-fibre monocoque with push-rod actuated suspension on all four corners. The Lamborghini V12 engine was mated to a Lola designed and built six-speed gearbox. Tasked to drive the LC89 were Philippe Alliot and Yannick Dalmas. The package proved relatively competitive at its San Marino debut but poor reliability forced both cars to retire. It was the start of a difficult season, which saw an unwell Dalmas replaced by Eric Bernard and Michele Alboreto. The cars often failed to qualify but in a rare finish, Alliot managed to clinch a sixth place and a single point for the team at the Spanish Grand Prix. The LC89s were used for the opening two rounds of the 1990 season before they were superseded by the LC90. The new car proved an improvement and a total of 11 points were scored in 1990.